Plan hatched in secret. Law is long and complex. Vote was speedy and partisan. Results? 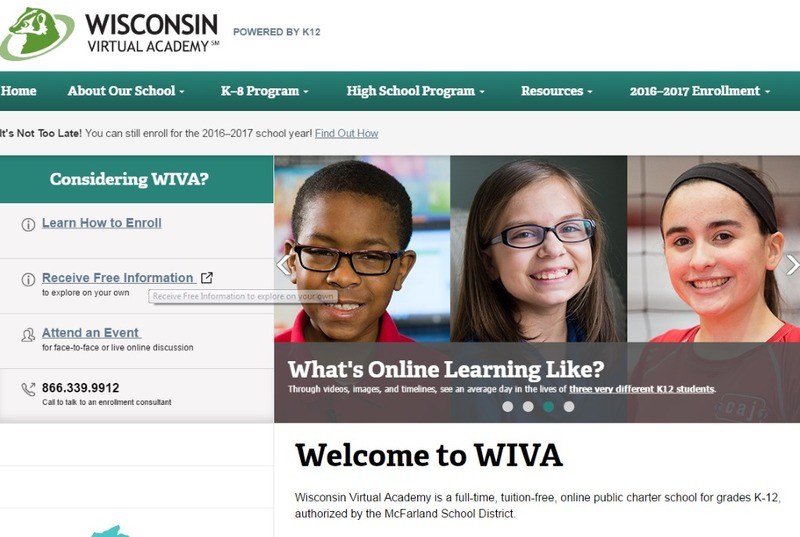 Screenshot of the Wisconsin Virtual Academy website. I spoke with one local superintendent whose district loses $12,000 per special education student but only received $2,400 in state aid per student. The district’s money goes to Wisconsin Virtual Academy. WVA is operated by K12, Inc. a publicly traded company co-founded by William Bennett former Secretary of Education under President Reagan. Wisconsin Virtual Academy is not a private school. It is a public charter school. It is a flawed premise to present the case that $12,000 per student is going to private schools and then only mention WIVA (not WVA) as an example when it isn’t a private school at all. Well, the vouchers are doing exactly what the Republicans want, putting our tax dollars in the hands of for profit private schools. It’s one more step in their goals of privatizing all of government and silencing the peoples’ voice once and for all. Next we end up a dictatorship and not even the Republicans will have a voice. They will never see it coming because they refuse to think their actions through to the end result.